You left out tanking. So say your 1/3 of a 20 plane compliment is on CAP (~6). That leaves you with 14 for striking AND tanking the strikers. So you might end up with a 10 plane strike package. This assumes that you have 100% availability of all you birds (unlikely). You need 48 birds per ship minimum. Ideally some Ospreys (V-22) too to provide tanking. I’ve never bought the coalition idea as it ties Washington and Whitehall together and honestly the UK deserves more freedom of action. The ships wouldn’t need half the planes for air cap with 2 type 45s along for air defense this isn’t 1982. You seem, in this article, to have completely forgotten that the plan is to have only one carrier in service at all times with the other either in refit / maintenance and / or on other duties e.g. as a helicopter assault ship. Therefore the initial 42 No. F35Bs should be adequate for this purpose, certainly in the first few years of service. It should also be remembered that the old 1960’s “Ark Royal” only had 28 No. F4 Phantoms available for carrier operations which I believed proved adequate. Clearly within the 50 year lifespan of these new ships this specific piece of criticism, if appropriate and at worst. can only be described as a very minor glitch in the ship’s development. I cannot help but think that the constant efforts by some to continually loudly and severely criticise these ships, by making mountains out of mole hills is politically based with generally little or no basis in facts. This topic raises some interesting issues. Top of the list must be strategic balance. 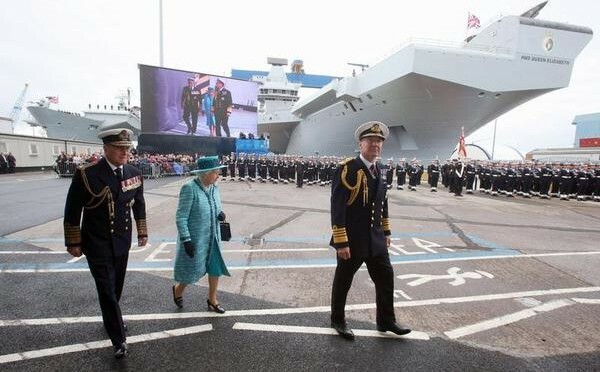 The Royal Navy, long the target of the dreaded defence reviews (ie ‘cuts’), is soon to acquire the first of these new super flat tops, with little or no apparent consideration given to the carrier’s dependence on supporting escorts and supply vessels. Both of these in varying ways, are lacking in current defence thinking. Firstly the purpose-built Defender class destroyers suffer from design flaws which show every sign of being insoluble. Secondly, any long range deployment would require at least four such units being available on station at any given time. Fuel and store vessels etc are also in short supply, especially when other, ongoing fleet commitments are taken into account. In short, this has not been well thought through! Two irreconcilable requirements are trying to be resolved at once, – adequate and balanced naval defence and the government’s dedication to national economic austerity. naval shopping list, (incapable of even contemplating new-design catapults for gas-turbine carriers), does not bode well for the future. The Royal Navy could end up being the the only nuclear-capable North Sea flotilla in history, if, of course, it owned its own stock of Tridents! Sadly Putin is right! Carriers make damn good targets!